Had an absolutely fabulous experience playing viola with the San Juan Symphony this past weekend. Along with Beethoven's Creatures of Prometheus overture and the always incredible and powerful Shostakovich Symphony No. 5, we played the world premier of James Stephenson's Concerto for Hope with trumpet soloist Ryan Anthony. As it turns out, my stand partner was Brian Newnam, who used to live in Los Alamos and knows my cousins the Tillerys! His wife Kate is a fine violinist as well. Our guest conductor, Geoffry Robson, currently with the Arkansas Symphony, did a fine job, connecting with the orchestra and the audience alike. Yes it's been that long since my last post and a lot has changed. Where to begin? Let me work backwards. One of the highlights of my musical life so far was to perform the Mozart Sinfonia Concertante for violin, viola and orchestra with David Felberg back in 2011. The concert was a smashing success with standing room only in Keller Hall at UNM, and a standing ovation. Wow - I still feel the glow from it all these years later. At the time, I was playing on a carbon fiber viola by Luis and Clark. After that performance, and after some quartet performances with the Giovanni String Quartet, I heard from a couple of friends including violinist Roberta Arruda and violist Peter Gregory that the newfangled instrument just wasn't projecting. I found this odd because under the ear, this viola was very loud. I decided to do some tests between my 16-7/8" Honeycutt viola, the Luis and Clark, and a viola owned by David Felberg, a 16-3/8" Yoshikai. For the test, I set up some microphones in the loft of our house, and played the instruments from my usual practice location in the den. The idea was to see how they projected and "filled the room" rather than the direct sound. The results were interesting. The Honeycutt was the clear winner, and the L&C and the Yoshikai were tied for second place. The problem I've always had with the Honeycutt is the size... it is just too big for me to play. Some larger violas have a shorter, thinner neck and a manageable string length, but this one is just big. Fantastic sound, though, as was evident in the recordings. So for that summer (2014) I decided to stick with playing the Honeycutt despite the physical challenges. I performed the Bach Brandenburg Concerto No. 6 with Rebecca O'Boyle on viola 2, and the APO chamber orchestra behind us. I sold the Luis and Clark and unfortunately took a beating on the price. It seems that the interest in these instruments has waned considerably in just a few years. 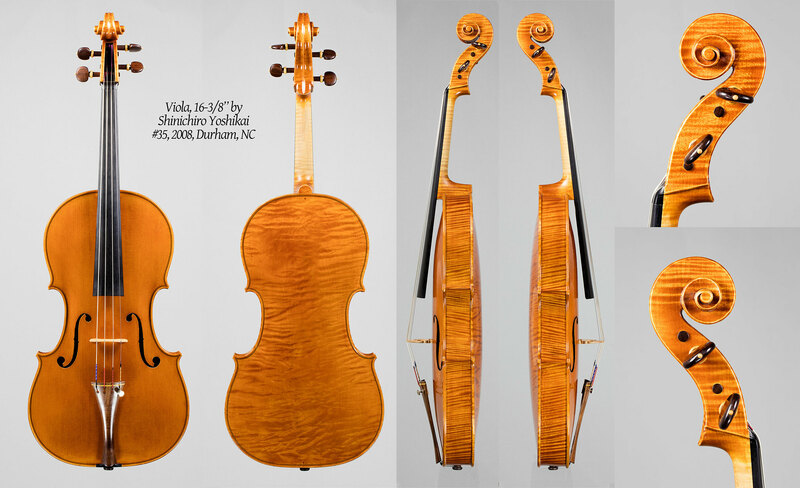 Then in the fall, I contacted David Felberg again and asked to borrow his Yoshikai viola once more, but decided to re-string it and also have Justin Robertson look it over and possibly adjust the soundpost, along with touching up some of the dings on the beautiful instrument. The result was: I fell in love with this viola and decided to purchase it. With the new strings (Larson A, Obligato D and G, and Warchal Brilliant C), the projection was there. And being a smaller viola at 16-3/8" I've found it to be very playable. Besides that, it is just a gorgeous instrument. Also in the fall of 2014, I was asked to join a new string quartet, since named the Petroglyph String Quartet. Members include Justin Pollak, Yakima Fernandez, Jayson Bishop and myself. Our first performance, in April of 2015 included the Beethoven Op. 18, No. 1, the Haydn "Lark", and the Brahms Quartet No. 1. HUGE program! Absolutely exhausting to perform, and thrilling at the same time. The Petroglyph recently put on our 2nd program on January 30th, with a program covering Mozart's K. 575 in D Major, Villa Lobos Quartet No. 1, and the Dvořák Quartet No. 10 in Eb. Once again, thrilling performance and wonderful audience response. 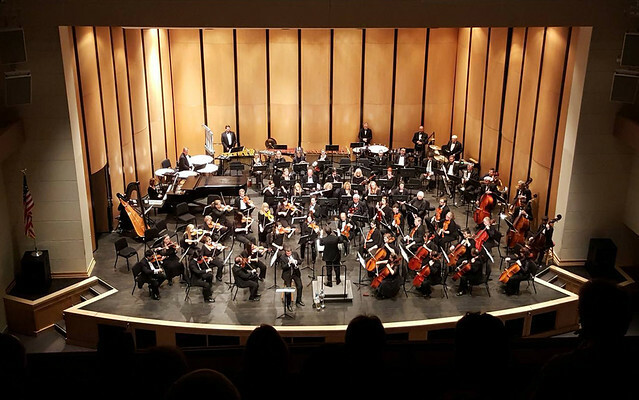 Coming up next in February, a performance with the San Juan Symphony including a world premier trumpet concerto by James Stephenson, the Beethoven "Creatures of Prometheus" overture, and the awesome Shostakovitch Symphony No. 5.